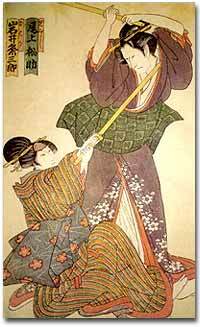 While most samurai warriors were men, some women were renowned for their skill in battle. A monument was erected to honor Nakano Takeko — a female warrior — at the Hokai temple in Fukushima prefecture because she asked her sister to behead her rather than die dishonorably from a gunshot wound in captivity. Being a warrior in feudal Japan was more than just a job. It was a way of life. The collapse of aristocratic rule ushered in a new age of chaos — appropriately called the Warring States period (c.1400-1600) — in which military might dictated who governed and who followed. The samurai warriors, also known as bushi, took as their creed what later became known as the "Way of the Warrior" (Bushidô), a rigid value system of discipline and honor that required them to live and die in the service of their lords. If commanded, true bushi were expected to give their lives without hesitation. Any form of disgrace — cowardice, dishonor, defeat — reflected poorly on the lord and was reason enough for a bushi to commit suicide by seppuku, or ritual disembowelment. In return for this devotion, the lord provided protection, financial security, and social status — in short, a reason to live. The bushi swore unwavering loyalty to their immediate masters in the chain of command. But this wasn't always easy. Frequently, switched loyalties and shifting alliances forced the bushi to decide between obeying the daimyô (baron) or following their more immediate lord. Although elegant and refined in appearance, Japanese castles were used as military installments. The wood used in their construction allowed these castles to withstand Japan's many earthquakes, but made them susceptible to fire at the same time. The daimyô reported to the shôgun, more out of political and military necessity than out of loyalty. The shôgun became the most dominant feudal lord by subduing the other daimyô and receiving from the emperor the impressive title "Barbarian-Quelling Generalissimo." Not that the emperor wielded any sort of political power — the awesome military might of the shôgun often left the emperor little choice but to grant the title. The shogunal rule of the bakufu, (tent government) began in earnest with the Kamakura period (1185-1333), when the Minamoto clan defeated its bitter rival, the Taira family. When Mongol invaders tried to land in western Japan, they were repelled by the Kamakura bakufu — with the help of kamikaze, powerful storms thought to be of divine origin. Despite this seeming divine favor, though, the bakufu could not withstand the unstable political situation on the domestic front. 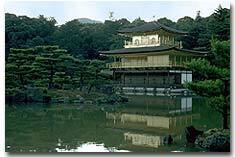 The Kinkakuji — or "Golden Pavilion" — was originally built as a villa for the third Ashikaga shogun, Yoshimitsu. Upon his death, the eye-catching structure became a Zen Buddhist temple — creating an unusual combination of extravagant decor and minimalist doctrine. The next to ascend to power were the Ashikaga, who established the Muromachi bakufu (1336-1573). The third Ashikaga shôgun, Yoshimitsu (1358-1408), was a patron of the arts and oversaw such cultural achievements as the construction of the picturesque Kinkakuji (Golden Pavilion) and the flowering of Nô drama as the classical theater of Japan. The greatest figure in Nô was Zeami Motokiyo (1363-1443), whose aesthetic and critical theories defined the genre and influenced subsequent performing arts. The downfall of the Ashikaga came about with the rise of the first of three "Great Unifiers" who sought to consolidate power. Oda Nobunaga (1534-1582) was a minor daimyô who embarked on a ruthless campaign for control that culminated in the removal of the last Ashikaga shôgun. 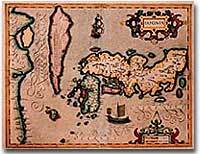 Japan was a land of mystery to foreign explorers such as the English and Dutch, as shown by this somewhat inaccurate 17th-century map. It was under Nobunaga's watch that Europeans first arrived in Japan, and he took full advantage of their presence. Part of his military success came from his use of firearms, brought to Japan by the Portuguese, which allowed him swift and complete dominance. Nobunaga's hostility toward Buddhism, which he expressed by burning countless monasteries and slaughtering monks, made him receptive to the influx of Jesuit missionaries from Spain and Portugal. When Nobunaga's tenure ended in betrayal and death, the next leader who rose from the ensuing chaos was Toyotomi Hideyoshi (1537-1598), one of Nobunaga's loyal vassals. The Japanese tea ceremony, otherwise known as chadô, has very precise steps to follow. 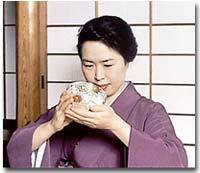 This participant demonstrates the correct way to hold a teacup; in her left hand while steadying it with her right. Originally a peasant of humble origins, Hideyoshi surged through the ranks to become a leading general. His hunger for power knew no bounds. He organized two invasions of Korea (both failed) and schemed to make the Spanish Philippines, China, and even India part of his empire. Hideyoshi's obsession with complete control pushed him to execute Christian missionaries and even to order the great master of the tea ceremony, Sen no Rikyû (1522-91), to commit suicide for no apparent reason. But because of his peasant origins, Hideyoshi was never able to become shôgun, and instead he became regent to the emperor. After Hideyoshi's death, another power struggle ensued, in which two factions battled over the realm. The side led by the powerful daimyô Tokugawa Ieyasu (1542-1616) prevailed, and within a short time the mighty Tokugawa bakufu was established in Edo — now known as Tokyo. Centuries of strife were finally over; for the next 300 years, peace and order would rule the land. Tennô (Emperor) Symbolic ruler of Japan, descended from and representative of Shintô deities; during the feudal period, mostly a figurehead. Shôgun (Generalissimo) Head of bakufu military government, with the power to oversee national affairs; receives title from emperor; usually the strongest daimyô. Daimyô (Lord of a domain) Powerful warlord with control over territories of varying size; strength frequently determined by the domain's kokudaka (tax based upon rice production). Kerai or Gokenin (Vassal) Loyal to the daimyô; receives fiefs or rice stipends from the daimyô; some comparable in strength to lesser daimyô. Bugyô (Magistrate) Appointed by the shôgun to oversee a specific government post (e.g., finance, construction), a large city (e.g., Edo, Nagasaki), or a region. Daikan (Intendant) Appointed by the daimyô or the shôgun to collect taxes and oversee administration of local regions. Shôya (Village headman) Commoner appointed by the daimyô or the shôgun to represent the bakufu at the village level. Who would win in a fight — a crusader or a samurai warrior? The world may never know, but we can hazard a guess. The Historical Armed Combat Association provides a comparison of the equipment and training of these two legendary figures. Make an educated guess as to who would win if they met on the field of battle. Be sure to bring your helmet and sword when you visit the Samurai Archives, a comprehensive megasite of samurai history. Get up-to-date with detailed chronologies and history articles, pore over maps and warrior family genealogies, and get to know some famous samurai through their biographies. Want to be a daimyô? Choose your favorite family crest and war banner and get ready to stake your claim to samurai tradition. 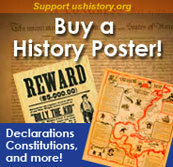 An outstanding resource by a devoted pair of samurai history enthusiasts. Even if you aren't an Ashikaga or a Tokugawa, you can still look at these cool family crests and feel like a shôgun.